Her power: No superpowers, Peggy Carter is a highly trained spy and military operative, skilled in hand-to-hand combat, weapons, and a variety of tactical and covert abilities. 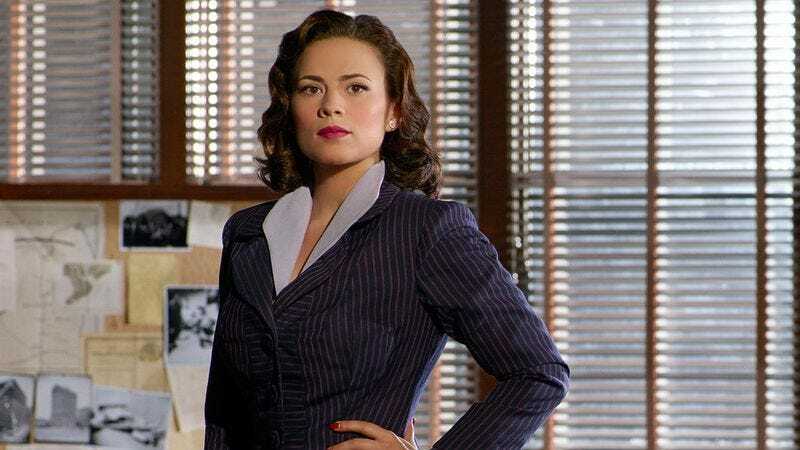 Her story: Growing up in 1920s England, Peggy Carter joined the British Royal Military, beginning with simple office work but quickly becoming a codebreaker during WWII. She was engaged but left her husband to become a field agent in British Secret Intelligence on the recommendation of her brother Michael. She became a liaison from the British government to help the U.S. fight the Nazis, joining the Strategic Scientific Reserve, the agency that eventually became S.H.I.E.L.D. Carter worked closely with Steve Rogers (a.k.a. Captain America) as he became the test subject for the super-soldier project led by Abraham Erskine. Peggy and Steve formed an intimate bond, but were thwarted in any romance by Rogers crashing his plane into the Arctic. Following the presumed death of Captain America, Peggy Carter led an SSR team into Germany during the final arc of WWII, destroying one of the last Hydra bases. She returned to the SSR unit in New York, where she was treated with sexist dismissals by her colleagues unfamiliar with her skills or history. She was soon contacted by Howard Stark, and helped him to clear his name after being accused of selling weapons to the enemy, exposing a secret Hydra project named Leviathan in the process, and helping capture Hydra agent Dottie Underwood. Shortly thereafter, she was sent on a mission to Los Angeles, where she again worked with Stark’s butler, Edwin Jarvis, to defeat a plan by Hydra agents and Hollywood starlet Whitney Frost to unleash Dark Matter upon the world. She also began a relationship with the local SSR head and her former co-worker Daniel Sousa. Decades later, having helped found S.H.I.E.L.D., raised a family, and grown old, she was found by Steve Rogers after his return, and he became a regular visitor, even as she suffered the effects of Alzheimer’s, up until her death in Captain America: Civil War. Currently, Peggy Carter is: R.I.P. Where will we see her next? Agent Carter has been canceled, so save some return trip to the past in a future series or film, Peggy Carter is dead.